Kulala Wilderness Camp, in the 37 000-hectare private Kulala Wilderness Reserve, commands a panoramic view of the valley and mountains beyond. Accommodation at Kulala Wilderness Camp consists of 10 comfortable "kulalas" (meaning "to sleep" in Oshiwambo) with en-suite bathrooms and verandas built on elevated platforms for that spectacular view. The main area is raised to take advantage of the endless vista and comprises a lounge and bar under thatch. Meals are taken on the deck and guests can cool off at the sparkling pool. Activities at Kulala Wilderness Camp are focused on exploring the nearby world-famous Sossusvlei - an enormous clay pan, flanked by the famous sand dunes that stand out starkly against the blue sky. These dunes - the most well-known being Big Daddy or Dune 45 - have developed over millions of years, the wind continuously refashioning the contours of this red sand sea. The 'vlei' itself only fills after rare heavy rainfall when, in a complete turn-around, it transforms into a spectacular turquoise lake. On the edge of the Namib, the oldest desert in the world, wildlife around Kulala Wilderness Camp is fascinating in its adaptation to the harsh conditions. Sparse, yet thrilling to see, are springbok, gemsbok, ostrich, bat-eared fox, the rarely seen aardwolf and many small fauna. Excursions to the incredible dunes of Sossusvlei are a must. As are guided walks and scenic nature drives. Take the main road B1 going south, and turn right into the road C24 after Rehoboth. In about 36 km turn into the road 1261 going through Reemhoogte Pass. Later you join road C14 and after Solitaire petrol station you turn into C36 road. Last turn is into the road 826 going to Sesriem. The turn-off is signposted (road to Sesriem / Sossusvlei). From Sesriem take a road 826 until the sign "Kulala lodge" (lodge is approx. 10 km further on off the 826 road to the right). No age restriction, under 6 years old sharing with parents: free of charge. 6 - 12 years old sharing with parents or in family unit: above discounted rate. 13 years old and above: full rate even if sharing with parents. Light breakfast - consisting of cereals, yoghurt, muffins, croissants, bread, fruit, juice, coffee, tea. 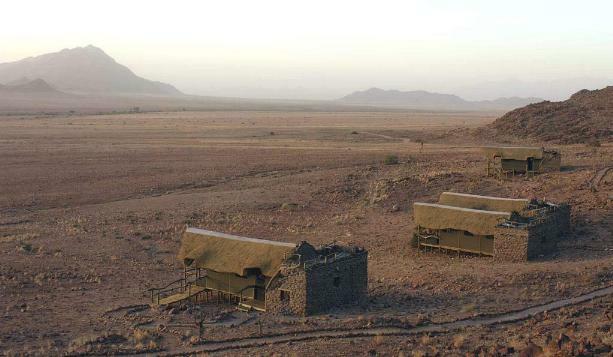 Depart from camp at 05h45 through the private gate situated +/- 45km away from Sossusvlei. Not many animals will be encountered while driving through this section of the Namib Naukluft Park. Stunning landscapes, dry river beds and contrasting sand dunes reflecting the morning sun rays capture the eye while driving towards Sossusvlei Pan where the seasonal Tsauchab River meets the ever encroaching barrier of red sand. Guests will have the opportunity to walk to Dead Vlei which is 1,1km from the parking area. Almost all our guests prefer scaling the Big Daddy dune +/- 345ft high to take Photographs of this fascinating landscape. This activity alone can take up to two hours. 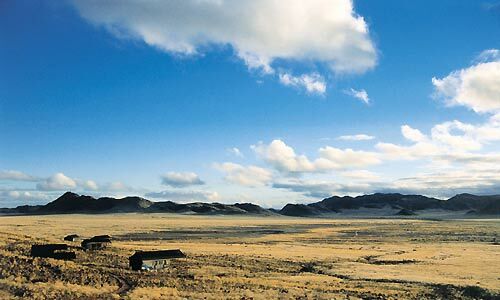 Guest who prefers to take it easy can explore the dry pans and surrounding sand dunes in the area. A hearty brunch with beverages is served round about 10h00 at the picnic tables in Sossusvlei consisting of, cold meats, chicken drumsticks, mini sausage rolls, samoosas, spring rolls, cheese platter, salads, breads, juice, coffee, tea and fruit platter. Guests arrive back at the lodge between 12h00 - 13h00. This activity starts with beverages, savoury and cakes in the main area where everybody meets at 17h00, departing at 17h30. The drive is conducted on our 30 000ha property with the possibility of seeing Oryx, Springbok, Ostrich, Jackal and Hyena but, sightings are not guaranteed. 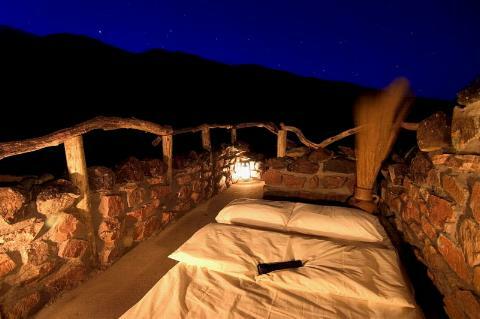 The main focus is the scenic landscape and the panoramic vista of the Namib Desert. The vehicle will stop at a suitable spot where sundowner's drinks and snacks can be enjoyed while the sun sets over the red dunes Guests will return to Camp between 20h00 and 20h30 to freshen up and have dinner. All Wilderness Safaris' establishments: due to a high demand the full balance is due strictly not later than 10 weeks prior to arrival! Special meals can be booked in advance. Rates are subject to change without prior notice should tax be increased or Government levies introduced. Rates include Value Added Tax.